How Will Brexit Affect Spanish Property Owners? Buy or not to buy? Do you have a property in Spain? Do you know about the impact the UK’s withdrawal from the EU will have on property owners in Spain? Norway First | Nicky Morgan, a pro-EU lawmaker who heads the Treasury Committee, called for the government to change tack and negotiate a Norway-style deal with the EU as the only possible way forward. Morgan warned that it might fall to Parliament to make it happen. “If the government will not accept that things cannot go on as they are and therefore adopt a speedy change of direction, then Parliament will have to step in and force a change of negotiating mandate,” she wrote in the Sunday Times. Nick Boles, a pro-Brexit Tory, has a proposal to seek a Norway-style deal as a first step, so that a fuller exit treaty can be negotiated later. The idea might just gain traction.Second Referendum | A march in London demanding a referendum on the final Brexit deal drew 700,000 people. Labour’s Brexit spokesman Keir Starmer called the demo “significant” as he reiterated his position that if May’s deal is rejected by Parliament, another plebiscite should remain an option. But remember, there are some massive obstacles to a second vote. The Guardian cited pro-referendum campaigners saying there may be as many as 50 Tories who could back a public vote, but it will be easier to win them over if Parliament votes against May’s deal. Business Cuts | Four-fifths of U.K. companies have cut or withheld investment because of the uncertainty caused by Brexit, Britain’s biggest business lobby said. Meanwhile, Philips CEO Frans Van Houten told Bloomberg TV that the company will have to review its U.K. manufacturing because of the split. Emergency Drug Plans | The Royal Pharmaceutical Society is calling for the U.K. government to grant pharmacists emergency powers after Brexit, according to the Sunday Times. The organization wants to authorize pharmacists to switch their patients to different medications without the approval of general practitioners in case of acute drug shortages, the newspaper wrote. Nothing to Say | Prime Minister May sought to reassure U.K. business that a Brexit deal was just around the corner on a conference call with more than 130 chief executives and officials from some of the world’s largest companies. But she offered nothing new. On the Markets | Politics will set the tone for pound traders this week, as investors see political risks growing, Charlotte Ryan reports. 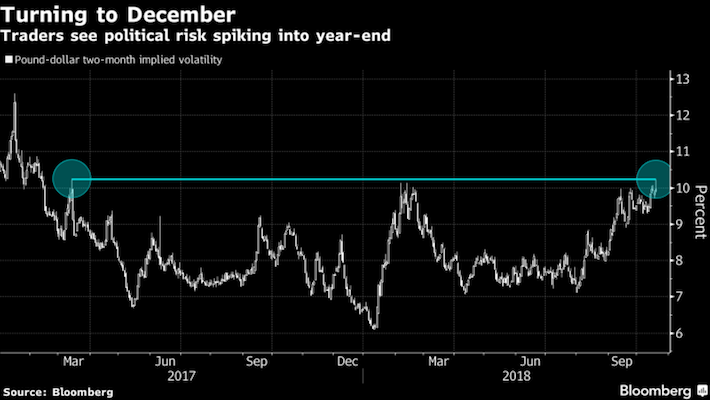 “We can only expect larger moves in sterling if we really get an end of the negotiations, and I mean really the end, which is either a signed deal or not,” said Thu Lan Nguyen, a currency strategist at Commerzbank. The pound, which lost 1 percent last week, traded at $1.3071 early on Monday. Spanish property expert Susana Lajusticia answers some common questions about the impact the UK’s withdrawal from the EU will have on property owners in Spain. Will I still be able to buy in Spain? There are no current restrictions nor specific requirements to be a national of one of the EU countries in order to purchase property in Spain. Based on this future British investment in Spain should not be affected by the UK leaving the European Union and British nationals would, in the current position, be able to invest in Spain should they wish to do so. Many clients invest in a second holiday home in the sun for their own enjoyment whilst others see their purchase as an investment. Spain has a lot to offer a has a great variety of tourism from its beautiful beaches to its stunning mountains. One point to mention is that as a national of an EU member state one can enter and leave, live and work in any member states without the need to apply for any permits/licences. The Post-Brexit scene leaves many questions as to the future arrangements for British nationals to enter/stay in other EU member states and for EU member states nationals to enter/stay in the UK and this is something that surely all would hope can be resolved in the best interest of all citizens involved. Will it be more expensive to do so? When you purchase a property in Spain transfer tax is payable on existing properties whilst Spanish VAT and stamp duty are payable on new built properties purchased from a developer. The current rates for both taxes, transfer tax (Impuesto de Transmisiones Patrimoniales) and Spanish VAT (IVA) and stamp duty (Actos Jurídicos Documentados) are paid by the purchaser in any transaction and the rates are applied regardless of the purchaser’s nationality or being a national of an EU member State. Additional costs to be taken into account are the notarial fees (being Spain a Notarial system, a Notary is involved in every transaction as a Public official who conveys the property) and Land Registry fees payable to the Local Registrar. All the above taxes and disbursements are payable regardless of the purchaser being or not a National of an EU member country and hence one would not expect purchasing a property in Spain post-Brexit to be more expensive. Will I have the right to rent out a property I own in Spain? The rental of properties in Spain is regulated by the Ley de Arrendamientos Urbanos and regional legislation by each of the 17 Autonomous Communities. The main legislation, Ley de Arrendamientos urbanos, covers the rental of a property as a main home and for other uses eg. temporal rentals, whilst the so called “touristic rentals” or “vacational rentals” are regulated by each region/Autonomous Community and these touristic rentals can be heavily regulated in some areas. There is no current reference nor restriction related to the landlord not being an EU national and therefore as we stand there would not seem to be any restrictions on rentals. What protection will I have as a UK buyer overseas? All property transactions in Spain are completed by the signature of a deed of sale before a Notario (Spanish Public official) who conveys the property, confirms the identity of the parties and gives validity to the transfer of the property. A Notario is a Public Official who acts for both parties hence why obtaining independent legal advice and instructing a lawyer is highly advisable. A lawyer who is qualified in both countries, Spain and the UK /your country of origin and/or residency, would be the main choice for purchasers who want to protect their interests and receive advice on their investment. I already own a property in Spain, will I be at a disadvantage if I try and sell after Brexit? Unfortunately, we do not know exactly what the Post-Brexit scenario will bring and whether future Double Tax Treaty International Agreements will be signed between both countries to solve any issues that might be brought up. The UK and Spain already have Double Treaty Agreements, one in particular related to Income tax whilst for example there is no Double Tax Treaty related to Inheritance Tax (IHT) – although the Inland revenue in the UK takes into account any IHT paid in Spain. Currently we can find different tax rates that apply to EU and non-EU nationals, related to Inheritance tax and Income tax. However tax rates are in constant change and hence it would be impossible to predict the future tax position. If you are planning to buy, rent or sell real estate property in Barcelona, contact Kakdoma BCN at kakdoma@kakdomabcn.com, +34 644 235 607. We provide personalised services to help you to make a right decision and reach your goal.